Bajaj Finance : EMI option with 0% interest, No Money Required. Baldness in men is caused due to various health disorders. Every 2 out of 3 men either have or will face localized hair loss problems in their life. Nearly 38% of men turn partially or completely bald. This is the reason why more and more men are opting for hair transplantation using the micro-follicular hair transplant technique. Using this treatment, it is quite easy to implant grafts of 1, 2 or 3 hair in between the existing hair and achieve satisfactory results. Similar to the other cells present in the human body, hair is alive and follows a natural cycle of growth. The cycle is divided into 3 phases, which are anagen, catagen and telogen. Anagen phase is the phase in which the hair grows. This phase is the longest part of the hair growth cycle since it lasts for around 2 – 5 years. Therefore, we have most of the hair in the anagen phase. Catagen phase is the phase in which the hair stops to grow. This phase lasts for over 3 weeks, which is negligible as compared to the previous phase in the hair growth cycle. Lastly, the telogen phase occurs after around 3 months, which leads to the loosening or death of the hair and this will leave free space for new hair follicles in the anagen phase. 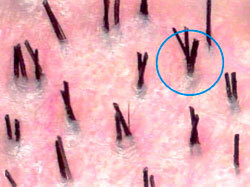 The hair in the telogen phase is what we see every day on the hairbrush. The abnormal shortening of the hair growth cycle leads to baldness. Since the number of hair growth cycles is limited to only 25 – 30 cycles in one’s life, it is important that you act quickly after you notice the first symptoms, so that you can avoid the complete exhaustion of hair capital in just a few years. Appearance of free radicals cause an inflammation of the tissues as well as the ageing of follicular cells. As a result of this, the lifespan of the hair is lowered. It is important to understand that the number of hair growth cycles is limited and during a lifespan, the hair will undergo around 25 – 30 hair growth cycles. The fact that the hair growth cycles have a lifespan of 2 to 5 years means that we have fairly enough hair growth to last for a lifetime. Therefore, it is essential that you act quickly upon noticing the initial symptoms of unusual hair loss because once your hair capital is exhausted, it would not be possible any longer to regain your hair. 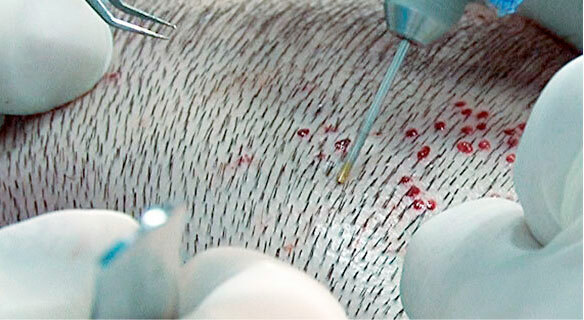 This procedure does not leave any scars on the donor zone, since the diameter of the punch utilized is often as small as, or perhaps smaller than 1 mm. Since it is minute and delicate, this procedure is recommended for smaller sessions of less than 1000 grafts. However, for more then 2000 grafts, you need to allow sessions spaced over 2 days. The density-price ratio is higher because as more sessions are needed for an equal amount of implanted grafts as compared to techniques in which grafts are extracted from the strip of the scalp. The grafts are extracted one at a time in the dermis using a cylindrical hollow punch that might be linked to an ultra modern machine that makes it possible to extract almost a thousand grafts in just a few hours. These grafts are then re-implanted generally on the area that needs to be covered. Follicular unit extraction makes it possible to transplant individual hair follicles without using a scalpel, without excision and with no need for any stitches. In the procedure, the hair is selected from the donor area, for instance the back of the head, and extracted using only a local anesthetic. Following this, the grafts are removed one at a time using each graft encapsulated in a small cylinder of skin. After this, the doctor will make tiny incisions in the recipient area and determine the thickness as well as direction of new hair. Now, the grafts are inserted again under a local anesthetic. The hair transplant looks completely natural and the new hair is strong and healthy, as it was prior to being transplanted. Is there a risk of damaging the hair follicles? There is minimal risk of damaging grafts with follicular unit extraction treatment. The doctor will determine and pick the grafts that need to be transplanted and this will not disturb or destroy the surrounding hair follicles. What are the surgical techniques involved? The treatment does not involve scalpel or stitches, thus minimizing the risk of scarring. Since there are no stitches required, patients do not feel any pain or loss of sensation, and the area heals within a couple of days. The grafts are transplanted using microscopic instruments and it is almost impossible to detect the surgical area over a period of time. What happens following the hair transplant procedure? After the procedure, patients can resume routine activities after a week without any restrictions. Is it possible to check the number of hair follicles? With follicular unit extraction procedure, the doctor is able to precisely determine how many grafts are required, and then transplant exactly the desired number onto the recipient area. Is there any scarring after the hair transplant procedure? After the follicular unit extraction operation, patients are almost scar-free, even if the hair is kept very short. Each graft is extracted individually, without using a scalpel or surgical incisions. What is the healing process like and how long does it take? After consultation with the patient, the doctor will transplant the number of hair follicles that are required to the recipient area. It is also possible for patients to influence the number as well as positioning of the hair follicles during an operation. New operations are not subjected to waiting periods. What is the meaning of follicular units? Follicular units are the size of the graft and the number of hair the graft holds. Across 30 years of work in developing new hair transplant techniques, it is now possible to have extremely tiny follicular units. Earlier, hair transplants involved larger grafts, however, with new age hair transplant methods such as follicular unit extraction; it is now possible to have 1, 2 or even 3 hairs in each graft. How long does the transplanted hair last? As the hair that is used is taken from a donor area that is not sensitive to the hormones that cause hair loss, for instance the back of the head, it retains its genetic characteristics even after the transplantation. A majority of the patients continue to retain the new hair for the rest of their lives. It is only sometimes that a percentage of transplanted hair might be lost with the normal process of ageing. During treatment, a local anesthetic is used on the treatment area. A majority of the patients experience absolutely no pain during or even after the hair transplant procedure. Patients also receive medication following the treatment if he or she wishes, however this is seldom necessary. Is there a risk of infection from the hair transplant procedure? An infection from a hair transplant procedure is very rare. However, if an infection does occur, it is easy to treat it with antibiotics that are prescribed by the doctor. We have no records of any infections to date. The cost of treatment can vary and depends upon the type of treatment as well as the size of the area that need to be treated. Generally, we provide this information after a free consultation session. How much hair is needed to cover a certain area? As the number of hair required depends upon the hair structure as well as hair quality, it is no possible to say how much hair is needed before the patient is examined. Darker, coarser hair needs less hair to cover the same area as thinner, lighter hair. The hair required also depends upon the patient’s wish with regards to density and look. Why do I not need to spend the night at the clinic after undergoing a follicular unit extraction treatment? Follicular unit extraction is a minimally invasive treatment that does not need a general anesthetic. The procedure only requires a mild local anesthetic. Patients feel fine almost immediately after treatment and therefore do not need to stay under observation. How is it possible that follicular unit extraction is a painless procedure? Advance Medical Systems has several advantages over the competition, our clients get service that is bar-none and a center that can provide services for all your needs, from dermatology, cosmetology to plastic surgery, this chart will compare services and specialties of each center and doctors.